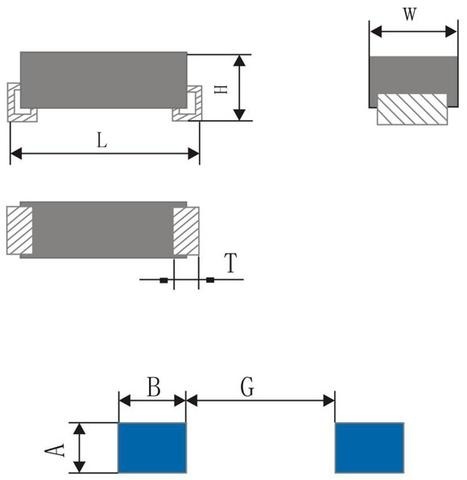 Shapes of resistor and capacitor and bonding pads are as shown in Figure 2.1.1. Bonding pads ’ width is calculated according to equation (1), resistor pad length is calculated by (2), and capacitor pad length is calculated by (3), and the space between pads is calculated by (4). 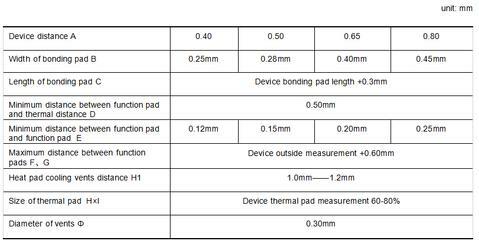 Commonly used bonding pads ’ size for resistor and capacitor are listed in Table 2.1.1(a) and Table 2.1.1(b). 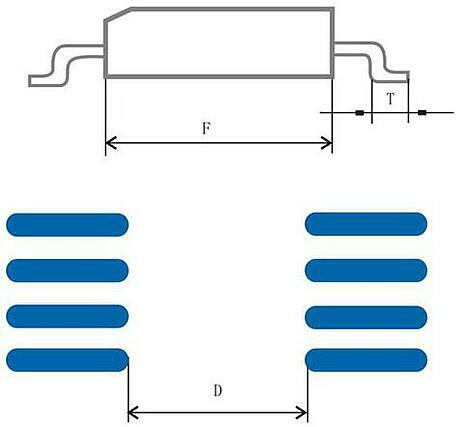 Shapes of tantalum capacitor and bonding pad are seen in Figure 2.1.2. Bonding pads ’ width is calculated according to equation (5), length is according to (6), and gap is according to (7). 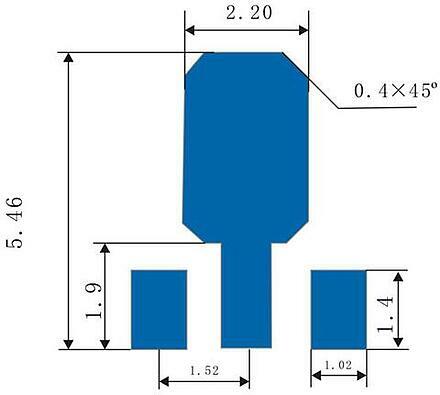 Commonly used molded plastic tantalum capacitor bonding pad sizes are listed in Table 2.1.2. The shape of bonding pad is rectangle. When the reflow soldering process is applied, a concave groove must be designed (See Figure 2.1.3), and the width is usually 0.30.05mm. But if components are fixed by cementing compound before soldering, then there is no need to design a concave groove. 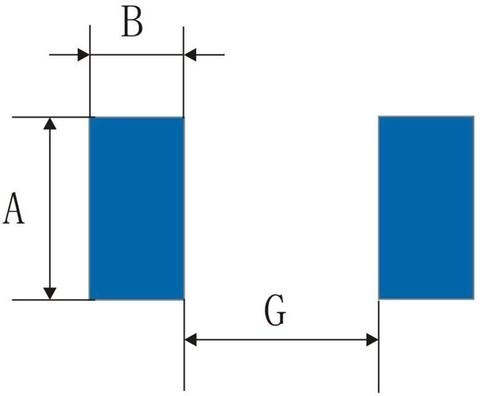 Commonly used cylindrical component bonding pad width, length, and gap, and length of concave groove are listed in Table 2.1.3.
b) Bonding pad length is 2.5 to 3 times of the solder PIN length, 3 times is recommended. The center distance of bonding pad equals the center distance of leading wires. The size of bonding pad extend 0.38mm from around the soldering end (15mil). For most commonly used bonding pad SOT23、SOT89、SOT143, see Figure 2.2.2 (a), 2.2.2(b), 2.2.2(c). 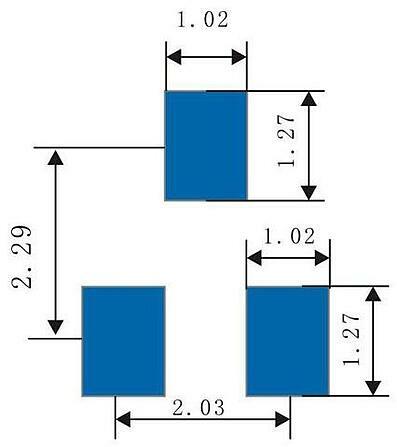 SOP shape and bonding pad shown by Figure 2.2.3, calculation of bonding pad width, distance between pads, bonding pad length by 2.2.1. Calculation of the inner flank distance of two rows bonding pad by equation (8). The shape of PLCC and bonding pad see Figure 2.2.4. Usually, the width of bonding pad is 0.76 mm, distance between pads is 0.51 mm, the length of pad is 2 mm, the equation (9) and (10) are for calculation of outer flank distance of boding pad. a). The center of every solder ball has to dovetail with the corresponding solder ball center at BGA bottom. b). The pattern of PCB bonding pad is solid circle, through holes must not be made on the pad. c). 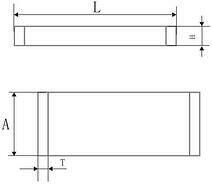 The width of conducting wires need to be same,in general 0.15mm~0.2mm. d). Soldmask size has to be 0.1mm~0.15mm bigger than the bonding pad. e). After though holes being punched and plated, block them with dielectric material and conductive adhesive, with its height should no taller than the bonding pad. f). 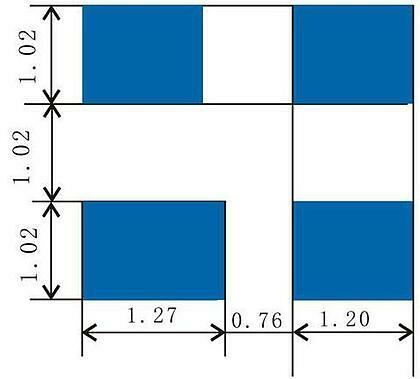 To process the screen graphics surrounding the four corners of BGA devices, line weight should be 0.2mm~0.25mm. g). The bonding pad of BGA devices is round shape. Generally speaking, the diameter of bonding pad is 20% smaller than the solder ball’s. As for the pylomes beside the pad, soldmask need to be performed so as not to cause short circuit and cold solder joint by the loss of solder.